Cynthia was born in Barbados to parents from Dominica. Her mother was from the Carib-Indian tribe and her father Black. She recounts the story of growing up in a very strict household as one of four children in a house that her father built. Cynthia move to England following her marriage to an English merchant seaman, fulfilling her curiosity of seeing what lay beyond the horizon. She moved to Hull in 1972 and considers how it has evolved in its acceptance of garlic and ginger as ordinary rather than exotic and the realisation that Barbados is not in Africa. JW: Thanks for coming in. JW: It’s good to meet you. Can you introduce yourself, first of all, so that people listening in know who we’re chatting with? 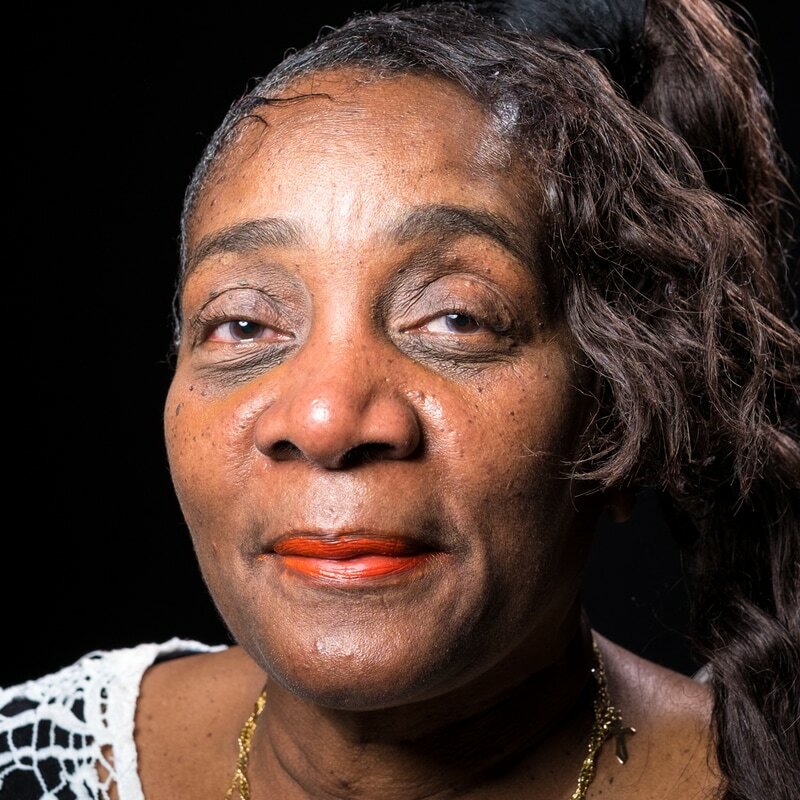 CB: My name is Cynthia Mary Beatrice Bailey and - I was born in Barbados and I came to Hull way back in 1972. JW: Oh right, OK. So tell me about Barbados, what do you remember of Barbados, your very earliest memories? CB: The earliest memories what I can recall growing up with my two sisters, my eldest sister and my youngest sister, Bernice and Violet. And Bernice now lives in South Wales and Violet has returned to Barbados after many years working for the United Nations. And we grew up together in a house that my daddy built, this is some of the earliest memories that I can recall, I remember we, I suppose at the time we did not understand but now late on, you know that were renting a house further down the gap when my daddy was building this house and he used to be a seaman, merchant seaman, and I remember the house, I can still see the frame, you know, the framework of the house, I do not remember the completion but, we moved in there and - lovely gardens, it was a two bedroom house, what we would describe as a bungalow, but a wooden type bungalow with two extremely large bedrooms, living room adjacent and a kitchen - it was a tiny kitchen and there was a dining area with a huge wooden pine table again that my daddy built, and I loved the house, we had outdoor, of course - bathroom and toilet. And the toilets at the time, they were not your flushing type toilets, they were like, again I think this was built where you dig an enormous hole down in the ground and then they built a thing around it, and so that was the toilet, I was terrified I used to have visions of falling in I’m telling you now, it’s like I can recall it all, falling into that pit, oh, you know it was scary, but you know, and then the bathroom next to the toilet was a big - like a galvanized type tub and my mom used to fill that up with water and we’d bathe in that and splash about and I won’t tell you the naughty thing that I did to my mom one time, but, you know, we splash about in that tub, enjoy it, and something I had loved doing, living in that house, I always to this day still do, I loved growing things and I remember growing peanuts, peas and corn, oh yeah, and pumpkin, yes, you know, I always loved putting these seeds in the ground and then watching them grow and the pumpkin was the best because I had never ever seen pumpkin grown before and all I remember was seeing this vine spread all over the place and then you see this big bright, yellow flower and then suddenly the flower disappeared and I did not know that was the making of the pumpkin and of course these pumpkins they were green and so would be camouflaged with the leaves and everything and until I think it was one of my sisters had stumbled on this humongous thing, I just thought “What is it?” you know, and there was this enormous pumpkin, I’m seeing it now, it was like from there to - a really big massive thing, don’t ask me what happened to it, I don’t know what my parents did, whether they sold it, used some of it I don’t know but, you know, that much I remember and also the nuts, I had loved pulling the nuts out of the ground and then eating them, they were really milky, sweet and creamy. The peas, well you know, we all shared in the peas and so on, and then we had also lots of chickens, my mum kept chickens and ducks and every chicken had a name, we loved our chickens, and my mum just only had her eye on this chicken “You’re for the pot” but we did not see it like that, it was “No, no, no” and all three of us sisters used to get together and hug each other “Please don’t hope it’s not mine, hope it’s not mine” and whoever one it was that went into the pot for the Sunday meal we never ate, we didn’t eat it, we just could not eat our little friend, no, so, yeah, they were some of my earlier memories. Yeah. JW: Tell me more about your mum and dad, starting with your dad, a very practical man by the sound of it. CB: Yeah, yes, very strict he was, well he passed away now, about - two years ago, just a couple of, 21st of this month, yeah, and he was very, very strict, and especially when it comes to cricket we could not breathe - I whisper like that because if we were speaking among each other - he would just come out with the loudest voice, “Shut up, shut up” you know, - so I hate cricket even to this day. JW: Was that listening to cricket on the radio? CB: Listening, watching, anything to do with cricket I don’t like, I don’t even ask me what is a – is it a no ball, overs whatever I don’t know. And I just never paid interest, never liked it from being a child to this day because all I can just recall him “Shut up, shut up, shut up”, you know, but daddy was very strict, nothing, you know, you just, we just had to be careful because he was an extremely strict man and any little thing out of place we would get the strap. But he worked hard, he worked hard, he did not want my mum to work because he said it should be the man who should do the job, you know, your job you stay at home and take care of the children but I think my mum, I know she was bored because she didn’t want to, you know, but he was, he went to work he took care of us as I said he built our first house, you know, until later, years later when my brother came along back in 1964 that we moved away from the house that he built, but - he always took care of us and – swimming, I can’t swim, why? Because when daddy used to take us to the beach and say you’ve got to learn to swim, well it was in the sea and it wasn’t gentle with armbands and I recall him picking me up, - swssh and I can still see, glug, glug, glug, trying to climb to the top. Yes, yes so, you know, but as I said he was a very, very good man, really strong, fit man even up to before he passed away. His last couple of years he had spent in a home and he passed away at 95 but before that, every day he used to go to the beach, go swimming, make his own meals, everything, I think dementia was setting in and hence that’s why he had to go to a home, yeah. JW: Was your mum equally strict? CB: Wee, - you know, my mum was but she was a bit more lenient, yeah, she was a little bit more lenient than my dad was, yeah, but my dad was very, very, very, very strict, yes, yeah. JW: So what plans did your mum and dad make for you when you were a child, what were their hopes for you? CB: Well, if they can hear me from beyond the grave I’m still waiting to find out. Because you see, now – my parents – I was born on my mum’s, my brothers, my brother and my sisters we were born in, on the island of Barbados, my parents were not, my mother is from Carib–Indian origin, so be careful I might eat you we’re from that tribe the Caribs, and – my dad Black but they’re both from Dominica, not Dominican Republic, people get confused between the two, but the Caribbean island of Dominica which – their language is like – Creole-French or what is known as Patois and 99% of the time my parents always spoke in this Creole patois, again, next to cricket, I don’t like the French language so I hope you’re not French, you know, but - they always, always, always no matter what the conversation it was always like that, where my dad was being, you know, very good with his English, but I think my mum still, you know, used to struggle when it came to speaking English because she’d begin to speak to someone and then suddenly it would be - and then she’d revert to Creole-French so, you know, I think that she liked that language, she loved it, she loved anything French, but for whatever plans that they might have had it was never shared with us, they never shared it with us, so we never knew, all we know that in the beginning we went to a private school, primary school, and then later on because my mum was a devout catholic my father not, he was – Anglican or Church of England as you call it and so, but my dad always respected what my mom wanted and so we went to, after the private school, we went to Catholic school. JW: Can I just ask was that unusual to go to a private school, or was that the system? CB: I think some, I don’t know if it was, I think maybe it was, I don’t know, you know, because we were little at the time and sadly I had never questioned these things, but we went to a private primary school, it was just around the corner, whether or not that it was convenient or not I really do not know but we went to this - private school and later on when we had moved away from the house where my dad built then we went to the Catholic school because the Catholic school was about – maybe like from here to where Hull College is, you know, that distance, walking distance, and we walked to school every morning, going to the Catholic school and we were brought up to be Catholics although I know that there were times – my dad, and as you get older, you know, the more years you understand the debate about religious beliefs, you know, for us because I recall one time that, you know, my parents had this discussion of course in Creole-French and then later my dad came to us and he said “Oh, you like come to church with me on Sunday?” and we said “Oh, yeah” because we wanted to see what this other church looked like inside. And we said “Oh, yeah, we will” and we went along and as children you don’t really know what’s going on and when we got back and he said “Well tell your mother what you think” and we said “Oh, we like the church it was really pretty inside, lots of nice flowers“ and that was the attraction for us, you know, and – then all I know we went back to our Catholic church and Sunday School and those sort of things. Still I’m Catholic today, yeah, well I call myself Christian, not like to give myself a religious label, but I go to Catholic church, yeah. JW: Tell me a little bit more about school, how did you do at school? CB: I did extremely well at school, I always got top marks, you know, and I was always in, because schools were always streamed where you get - A for the very, very bright kids, B, I don’t, today I don’t think I like that, you know, teaching myself, and I don’t think that I like this streaming thing, you know, I think we should all be treated as equals, but that’s how it was at school, you know, so I was always in the A set and – you know, I think one or both of my sisters were the B set and things now looking back what I did not like about the streaming it was, if you were in the A set then your job should be like doctors, lawyers, teachers, civil engineers, you know, that sort of thing, you’re in the B set then you have to look for things like, maybe – what they would have considered nursing to be, you know, that sort of thing and – maybe clerical work, working in an office and if you were like in the C or D set then, well those who were in D just have to stick to domestic work, I mean, that’s dreadful, you know, so you have to look to become a cleaner or something like that, if you were in the C set then you would have to look at more cooking, you know, and I just thought “Oh, I don’t like that” but that’s how it was back then. JW: So if you were in the A set – did you set your mind on a career? CB: I had three careers in mind and one was the, the top of the list was to do nursing, second teaching and at the bottom of the list was to be cabin crew and then after flying I thought cabin crew was out of the window and I must say I did go into nursing and – I was turned off from nursing when I just find that they treat people as a number and not – human, you know, a person. There it would be bed number five or with the in-growing toenail or something like that and - then I also find that, - you know, part of nursing, you know that you know people are very, very poorly. You may go on a break for five minutes and you come back they are gone. It just happened to me on many an occasion and I just thought no because where others were so “You just get over it,” my eldest sister, she is a nurse and she would be “You’ve got to be hard to do these things,” that she’d say to me how can you be hard, you know, you were with that person and then suddenly, and I just thought I am not going to make a good nurse, you know, and - so I just realised that it… as much as I like it, but not for me and – so went to teaching. JW: So where did you, where did you do your teaching training? CB: Here in the UK. Because in between that you see because I kind of like started my – careers a little bit late, later than most people because although I worked, sorry when I was back in Barbados but however, I got children, got engaged and – then, you know, children came along, so my babies always came first, you know. Career would just have to wait, cause I did not want to be “Oh I’ll have - my children then stay at home with them for a few months or a year then go back to work.” No, I just thought it would have to be when they begin school, then once they are at school then I can go to work. JW: OK, so tell me how you found your partner? – how did that come about? Was this back in – Barbados? CB: In Barbados? Yes, now, I met this, well actually it was through my daddy, you know, I mean they were friends of my dad and I think my dad was always trying to marry me off. Both him and my mom, they wanted to marry me off for some unknown reason and I thought because the first, I think, that, they had, we’re not Muslim, but I think Catholics tend to be like that you know, that where oh – this guy looks like a nice guy, he’d be suitable, you know, he seems to have got an eye on my daughter. Yeah, he’d be suitable for her and then they ‘d try to marry me off to a guy that was about, I don’t know, he looked old and they were like that and not that never mind that he had looked old or whatever he looked like but I didn’t like him in that way. He wasn’t attractive or well to me anyway. Maybe others would find him attractive but my parents said he was well to do and you know good brass, whatever, but that wasn’t for me. So you know, but then - I don’t think my dad actually had intended this guy, you now, was a good friend of his, used to work with him and was always around and – you know, and whenever he was there and he was in the merchant navy like my dad and – you know, would always come and – you know, I thought oh he looks nice and most of all he’s from England and I think I want to get away from Barbados and see what this England looks like and – you know, so I think we both felt the same about each other - you know. Then – got together, married, children. JW: Can I ask was he Black or what? CB: No. An English guy from, from Surrey. JW: So this - so then you got married, had children? JW: Yes, Yes, so - how did it come about then that you moved to the UK? CB: Through him. He was the one who brought me over here, yeah. JW: So you didn’t move here specifically to do your teacher training course? CB: I think, you know, I mean I was so happy with my children and - if they were babies forever, I would be at home forever with my babies, you know but – when they started growing up and - when they had first started, I think, Primary school I used to go into the schools and do like volunteering - with the children and I, you know, the kids and I really always had a great rapport and I thought “Yes, I like this and maybe this is for me and not nursing, not anything like that so yes, so this is for me, this going into, to teaching” and it more or less started from there really, you know, I just was - investigating it or – yeah and even the, the teachers’ at the school, I remember the first school was St Johns Newland on Clough Road yeah and - they encouraged me and – tried to help me along the, the right path and I – even in between that I went to Hull College to do a, is it a City and Guilds I think it was you know and – it was City and Guilds and I went to Endsleigh … there was an Endsleigh Teaching College that I had to be because they were full time and I was doing that, you know, because I asked if I can do it part-time because of the kids, you know, so I did more or less like three quarters of the time lots of the work being finished at home and – went into work at Hull College volunteering as well, for some years and then did some part-time work further studies because I was always curious about I need to do this and that and that and that and see what Physics is like and Chemistry is like and, you know, things that like I did not do at school. I did not complete at school or what I did and had forgotten and thought “Let me refresh my memory because things always change,” you know, and – yeah carried on from there really. JW: Very good, want to back track just a little bit though – to ask you about the, the impact of moving to England. That cultural shock of moving from Barbados to England. Tell me more about that how…? CB: Actually it was the most exciting time for me because I always wanted to travel and I think it was like I remember the day that I actually left Barbados. It was a Sunday and – come the build up for that it was excitement because I always love – as I said travel and I’ve got this passion about planes and, and boats, you know, and as a child, and where we lived, the, not the first, not the house that my daddy built but when we had moved to another house and it was very close to the beach and every morning I’d wake up early and running down on to the beach just to watch these ships come sailing in and it was like you watching there and then out of the blue you’d see a little tiny dot and then this tiny dot turned in… it’s like wow I wonder what it’s like, what is beyond there and that was always in my head. One of my passions as a child was going with friends you know, family friends up to the airport just to watch these planes come and go and again it was that fascination which one did I like better. I don’t know, just seeing that big machine there on the ground, people board that then suddenly it’s gone and it’s up there and then it disappears. Oh and then visa versa, you were just looking and then there’s a dot and that dot gets bigger and bigger and there it is and so you know, so for me I was fascinated. At last I was going to be part of that, Wow, I’m now going to know what it’s like to be in that thing on the ground and take off. It was very, very exciting. Now the, the shock was when, of course, now I’m accustomed to it, when we have these lovely warm Septembers, well leaving Barbados in – September so there I am in just my, you know, lovely little ordinary dress I would say on to that plane and there and all that, you know, I remember people who had travelled who lived in America, lived in Canada say “it’s cold you know, you’re going to need really wrapped up warm clothes.” I remember my daddy when he used to come home from his travels and he had this huge bag with really thick woollen socks and all these… and we used to laugh and thought “Hey, hey Look at these funny clothes,” not realising that I’m going to need them funny clothes one day, and - and people would say that – “Oh, let us take a cardigan.” That would be enough for me, so I just had this cardigan, no warm clothes whatsoever and when we landed, because I think the plane that what we, what I came in on it went to Belgium and then from Belgium we had to take a plane to the UK, so, you know, of course in Belgium it was all in, internal so you didn’t feel any cold or anything and we got that jet from Belgium to the UK and it was one of these little planes that did not come up to the, the terminal so you landed out there then you had to walk across, you know, short… my goodness!! It was a bright, now I can say, warm but to me it wasn’t, September’s day. When I stepped off that plane, you know, that breeze I felt like someone had slashed me with a million frozen razor blades. I just was brrrr!! Freezing, freezing. It was awful and after that and then once we got home, got into the house I refused to go out. I was scared. Every day that September was beautiful sunshine, beautiful, beautiful. England was just how I had imagined it to be because we were living in Surrey and we were surrounded by apple trees and blackberries or brambles whatever you call them. All these lovely things that I had all of sudden had to taste those, you know, but I dare not go out and I’m seeing people walking around were so cold. I was so cold. I was scared so my husband at that time took me to Spain and mind, bear in mind I was just a, a youngster at that time as I got married very young and - then he said, “I know what will make you feel good, Spain.” So we went to Spain and stayed a month. Oh it was grand, it was warm, it was lovely but then I had to put my thinking hat on, “If you are going to live in the UK you have got a choice. You go back to Barbados or if you want to stay in the UK and give it go and get, you know, the ball rolling. Start thinking about your future, whatever you going to do etc.” Then you want to get used to that weather. JW: Did you find it even worse when you eventually moved North to Hull? CB: - yes. I thought “Where the heck am I.” I am glad, at that time, when I came to Hull that it wasn’t by train because I would have just stayed on that train and ran back. So fortunately we drove so, you know, whenever you are coming into Hull you get these beautiful signs ‘Welcome to Kingston Upon Hull.’ That was good but if I’d have come in on a train I wouldn’t want to be… I would just say “No I am being sentenced to hell,” because that’s how it had seemed, like hell. Yeah..
JW: So what year did you come to Hull? CB: Exactly one week before the Christmas, the Christmas that week was the following week, was a Wednesday. Yeah Christmas, it wasn’t Christmas at all, it didn’t look like Christmas, didn’t feel like Christmas, didn’t smell like Christmas. It was grey and dark and foggy and ugly. Typical British weather. JW: So was it a work move then? Did you move to Hull for work reasons? CB: - well not for me but for him. Yes he moved to Hull for work reasons, yeah but I got to like Hull, still do. JW: What were your first impressions then of Hull? CB: Well, as I said, when we first came into Hull, fortunately it was by car because if it was by train I’d be gone, you know but coming in it looked really nice, seeing this ‘Welcome to Kingston Upon Hull’ and that looked really sort of like welcoming and I’m looking around and I just had to keep everything with an open mind but something that I didn’t like, it used to stink of fish, oh and it had a really bad smell and I thought “Is that smell going to be lingering forever? Is that the fresh air or, you know, whatever?” but what made me like this place was the people. CB: Yes the people. Really, really lovely I find that there are. I mean where ever you go in the world, I say to people you're gonna find the good, the bad and the ugly and you know I know Hull has their good, bad and ugly but I would say from that day to this I've always felt welcome in Hull. The people have always been very nice and I do like the place, yeah. It's alright; I live here that's what makes it nice. JW: So whereabouts - in Hull did you move to? CB: The first time, ah, Walliker Street, opposite the fairground [Laugh]. That's where we lived first yes on Walliker Street. I remember that quite well, yeah. JW: So have you always lived in West Hull, ever in East Hull? CB: No, I think you need a passport to go to east Hull and I, you know, after when I first came to Hull living here in Hull I used to think I must get familiar to the place where I am living and every Sunday I always used to get on a bus and go round you know. Just get on a Number 10 or a Number 12 and just to get to know the places that where I am and so on and - I just find certain - you know. I like west Hull maybe - because it is close to the motorway and you can drive out, you know, - I like north like, you know, going into Beverley, around that area - Cottingham so-so but east Hull it was a big no, no for me. No I don't like east Hull, I know, don't ask me why just I didn't like it’s depressing. I don't know even today it looks rough. JW: Tell me about changes you've noticed in Hull over the years that you've lived here. CB: The fish smell has gone that was a big, big change. I, every change that they have made and I remember when I used to talk to a lot of the local people. - What were one of the first changes I can recall I think they were, is it the Princess Quay building and the Humber Bridge? And people, you know, a lot of the people who, you know, the older people or the older generation didn't like that and I think I fell out with an elderly couple because I said “Well change is as good” and they didn't disagree but they like Hull just the way it is. I thought oh O K, you know, - so I think two of the major ones it was the Princess Quay and the Humber Bridge and went around now digging up the place but I’m sure it will be for the, you know, the good but what else that has changed since I have been here?? JW: Have you noticed any changes in the community of Hull, the people that make up Hull? CB: ...the lights there well on that side where now there’s a Sainsbury’s it used to be a Jacksons’ supermarket and they used to have like a line of fruit and veg. shops there and I’d go in there to buy bits and pieces and I remember one day I went into the shop because like you know we always cook with herbs and spices and I went into the local fruit and veg. shop and I was looking for things like garlic and I remember that - the guy who had the shop he said “We don’t sell that foreign muck in here”. I thought oh and then there was a lady an English lady who was also in the shop and - she was outside, you know, she got what she wanted and she stayed outside then she said to me “Where are you from”. “I said Barbados” She said “Oh my God my husband is a Bajan”, I said “Really”. She said “Yeah” and she said “I know what you mean they’re not accustomed to these type of foods” but she said “I’ll tell you where you can get it from” and then she told me about this - Indian continental place on Princes Avenue. She said “Whatever you want you can get in there”. I said “Oh really” and she said and failing that she said “you know, well, definitely you’ll get that there but if you don’t want to go that far just down the corner of Cottingham Road there’s a guy called Webster’s and he sells lots of international things because of the University not far away and the students, - you know, will go there”. So I went to this Webster’s fruit and veg. place and find that he had some of the things, not all, but some of the things that what I needed so I used to go to him and get my garlic and, and curry powders and stuff like that. But you know I’d get that there but now today everybody wants garlic in every meal, in every fruit and veg. shop people are selling these things you know and it was also like - what I find is quite interesting like I, well my family always used to call me a dog, not in saying ‘you dog’, because I love chewing on a bone and maybe they would just say “Maybe in your life before you were a dog” but I just didn’t care and so any meat bone I’d buy and I used to look for chicken wings and if I said again people again gave me gave me funny looks. Looking for bones they were meant for the dogs. I would go into the market, when the market was a market, and I’d buy my chicken wings there and everyone - and buying the bones like I would buy a crappy things [laugh] and I didn’t care it was what I like and now today chicken wings a delicacy, wow! You go into a restaurant and it’s there on the Cordon Bleu menu. Chicken wings, ribs that was another thing, you know, if you wanted spare ribs. All of these things now you are paying a lot for them. So I’ve seen a lot of these changes that always bring a smile to my face because I thought oh years ago you know they were things that they would throw the chicken wings at me I didn’t have to pay them. If they wanted to take money they would just say five or ten pence or something like that and I’ve come away, bags of chicken wings I could put in my trolley and stuff like that. Now what do you know everybody is using them. Yeah. JW: ...in Hull. How would you describe Hull to people now? CB: Well, I, the first word that I always use is that it is a very, very friendly place and I think that it is despite all that goes on etcetera I still believe it’s a very, very, friendly place is Hull and I would say that it’s, you know, accommodating where whatever people may have, you know they keep within themselves and - so yes I like that. It’s - being tidied up now a lot more than how it was before and I, I’m looking forward to this new changes what they’re bringing in that will bring it in line with maybe other parts of the country. Things that what I, you know, and the negative things that what I’d say was always used to say if you were looking for example when people go shopping and they want to go they’re looking for fashion or something and I always will say that look jump on a train and go to Leeds or Manchester because it comes to Hull last. I think it’s still happening now, you know, they will go along to - to – lets pick on Primark, and there’s Primark in Manchester. You go to Primark in Manchester, you have a look around and you come back to Hull and you say or yeah I’ll find that in Hull. Nope. And then when they have their big clearout sale they probably say oh let’s send this to Hull then suddenly you see them all in Hull. So that’s my negative thing about Hull. But – you know, I think I can get most of what I want here in the city, you know, and – a lot more to do for families, communities because before you lived in certain places, certain areas, you know. I used to look at the many houses, the government, council houses that’s what I’m looking for. And what I did not like that some I think there are still one or two still there, it’s like because you live in a council house they had these great big ugly fences, you know you drive along and it looks as if they’re barricaded in so they can’t look out but where you live in your home you can look out your front window and have a nice view. They, who live in the council houses all they got to do is look at big wooden, well I call them barriers. You know they are supposed to be their gates but I just thought well that ain’t nice, you know and then I’ve noticed now that a lot of these especially on the North Hull Estate. Often I have to say are these council houses they’re so built up they look really nice. You see now and now they’re more exposed and I thought yeah that’s good, that’s really good and I think it made people within themselves feel better. Because once upon a time you used to hear so much bad things that used to go on in these areas and I thought well they want to treat people like that then what do you expect, you know. But now it is so much better, so much nicer, wow. JW: I’ve really enjoyed listening to you – but we’ve got to draw it to a close but one final question I would like to put to you. – Of all of your life experiences or perhaps of something you have shared today on tape what message would you want to – want people to take away? If you have one lesson you would leave with somebody what would that be? CB: I would say – now let’s see what I would say to people. Number one I would say because we must bear in mind that as I said Hull is very cosmopolitan. And I would say to people please do not segregate yourselves, you know, mingle that is the key, mingle. When you segregate yourselves you are asking for problems and everyone should get to know everyone and to respect each other, you know. Who they are, what they are, where they’re from without prejudice. JW: That’s a lovely message just to leave it on. Thank you so much.